From Sharla: After writing this article, I discovered a little more information about Joh Gere in the recollections of Fannie Giddings Norris that were set down by her family in 1931, when Fannie was 92. Fannie was the sister of Lydia Giddings Gere. 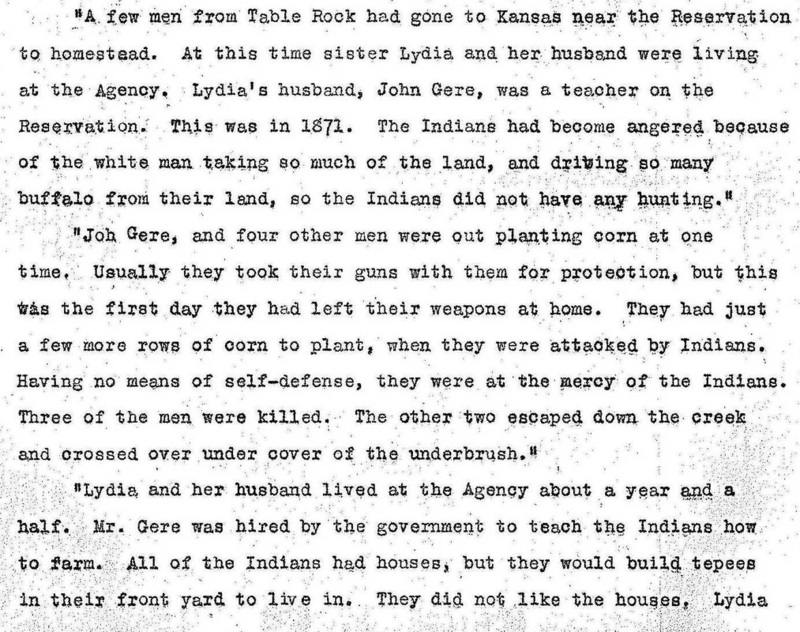 Fannie's story as set down seems to suggest that John was killed near the White Cloud reservation in Northeast Kansas. At age 92, Fannie's recollections may have been fuzzy but more likely the family members simply did not preserve this small piece of information. The information that they DID preserve, however, is great -- a small clue to John as a person -- for a year-and-a-half, he was a teacher on the Indian reservation where his brother-in-law C. H. Norris was the agent (the White Cloud reservation). Fannie also added a comment about Lydia's life after John's death, mentioning Lydia's second husband. Willis Luckey was the first of the Luckeys to arrive in Mitchell County, coming here in 1870 from Bartholomew County, Indiana. He took a homestead by the Solomon River near the present town site. According to the 1902 Mitchell County Atlas, Willis was the founder of Walnut Creek Township. He was here when three white men were killed by Indians near the bluffs in 1870, the surviving two making their way downstream, while hiding in brush, to his dugout. Soon after Willis settled at Glen Elder, his mother (commonly known as Ann) and several of his brothers and sisters came here also, taking homesteads in this area.